Nokia 2 is the latest and the lowest priced Nokia smartphone targetted at the low-end smartphone market. The phone is designed for a basic smartphone user in mind and comes with all necessary features which many smartphones don't offer at this price range. Nokia 2 offers an amazing built quality as the phone is made out of 6000 Series Aluminium and polycarbonate, 2 days of battery life from its 4100mAh battery and a promise for regular android updates which is not provided by any other smartphone brand in the low-end smartphone market. Nokia 2 offers many useful features that make it a great budget smartphone compared to the above smartphones. Nokia 2 outperforms both the devices in terms of build quality. Nokia 2 has a metal frame made out of single block of 6000 series aluminum and the back of the phone is covered with a sturdy Polycarbonate shell which provides superior build quality over the entire plastic build of the other two smartphones. Nokia 2 also comes with an IP52 Dust and Water resistance which is an added advantage. Nokia 2 offers a 5" LTPS 720p display which is better compared to the 4.7" 540x960 display found on Samsung J2(2017) and a 5" 720p TFT display found on Moto C Plus. It also offers Gorilla glass 3 protection which is not found in other two smartphones. The LTPS display on the Nokia 2 is claimed to be consuming less power which will provide a better battery life. This is the area where Nokia 2 beats the competition in this segment. We hardly see low-end devices get monthly security and major OS updates. Nokia 2 comes with Android 7.1.1 and will also receive the Android Oreo update in future. Whereas, both the above smartphones ship with Android 7.0 and there is no confirmation if the two smartphones will ever be upgraded to Android Oreo. So, Nokia 2 has an edge over the above two competitors. Nokia 2 has also started receiving the November Security Update at the time of writing this post. Another important but least bothered feature in this price segment is the types of sensors available in a smartphone. Many buyers don't take this into account while making a purchase decision. Having all necessary sensors in a smartphone is also important. Nokia 2 comes with all necessary sensors like Proximity Sensor, an Ambient light sensor for auto brightness adjustment, Accelerometer and an E-Compass for better navigation. Nokia 2 comes with an 8MP sensor at back and a 5MP sensor at front. Nokia 2 has more pixels on its front camera compared to the Samsung J2 and Moto C Plus. Camera performance of the smartphones can't be judged without using them in real life. I have used the camera on Moto C Plus and I can say that it is nothing special. All three smartphones have the same number of megapixels at back. 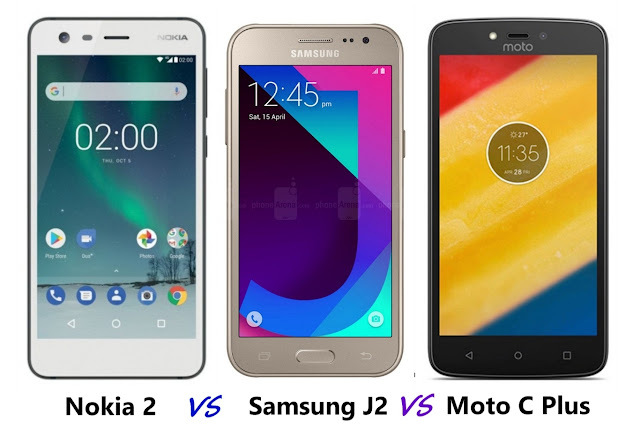 We should not expect anything special at this price range but only real life performance can tell which one out of these 3 has a better camera. Nokia 2 is a very nice budget smartphone for the first time smartphone buyers and the basic smartphone users. 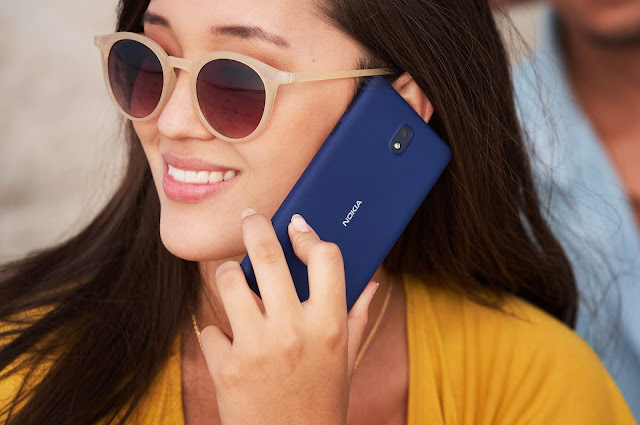 Nokia is not trying to compete on the hardware front but trying to focus more on the software side by providing regular security updates which are very much important these days especially in the Android ecosystem. Nokia 2 provides all needed features that make a phone a "Smartphone" along with stock Android experience the way Google has intended it to be. So, who should buy this smartphone? Nokia 2 is best for the first time smartphone buyers who are looking for a smart device with a great build quality and extra long battery life. Nokia 2 can also be a great option for users who are looking for a secondary device due to its extra-large battery which can be useful in emergencies.